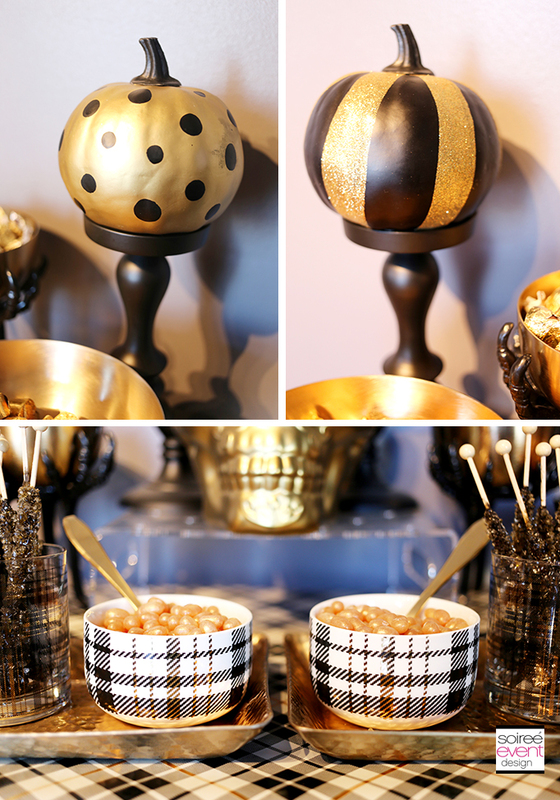 Trend Alert: Gold & Plaid Halloween Glam Dinner Party! Hey, party peeps! Have you been to Target lately? If so, you already know the hot new trend of the fall season is gold and plaid! 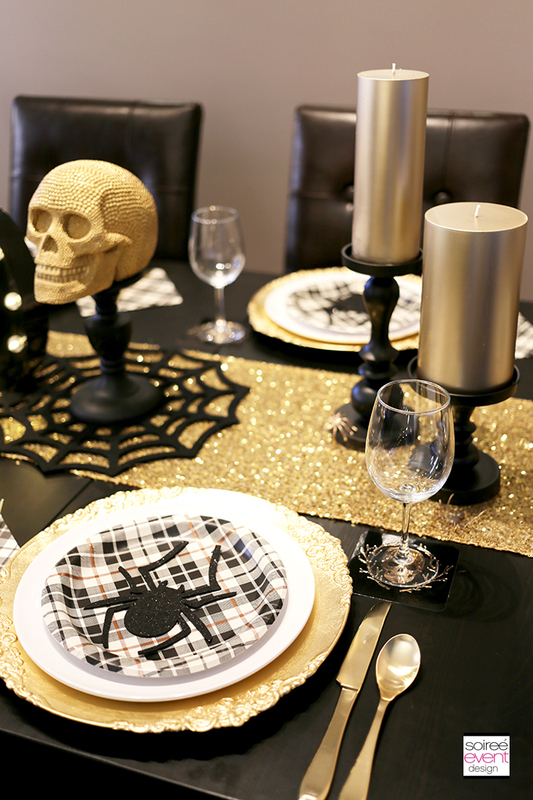 Today, I’m going to show you how you can get in on this hot new trend all season long—starting with this Halloween Glam Dinner Party using some staple and trendy items that will get you through the entire holiday season including Halloween, Thanksgiving, Christmas, and New Year’s Eve using my entertaining tips and tricks! 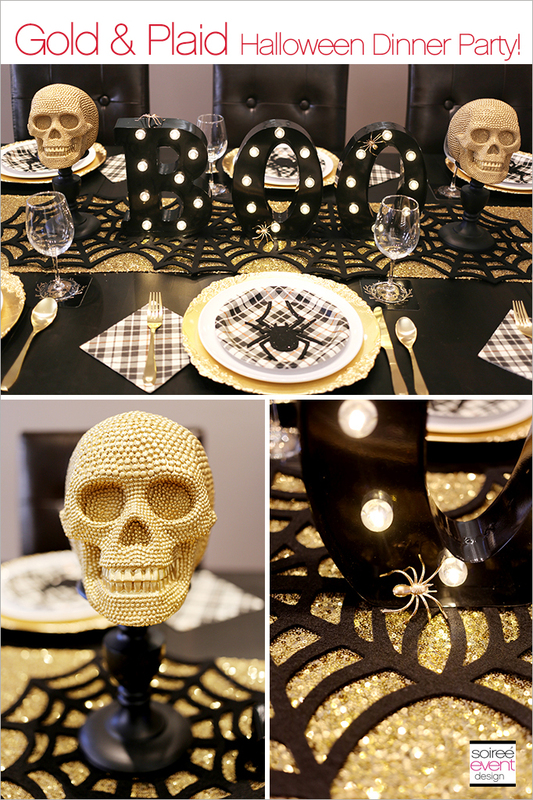 HALLOWEEN GLAM DINNER PARTY DINING TABLE! TIP #1: STOCK UP ON STAPLE DINING ITEMS FOR A DINNER PARTY FOR EIGHT! I happen to have a dining table that’s big enough to seat eight guests, so I stock up on staple dining items in quantities of eight. Since most dinnerware sets come in sets of four, I have to buy two sets of everything, including my all-white dinnerware and wine glasses. If you have a smaller or larger table, just adjust this tip to your dining table’s maximum seating capacity. GIRLFRIEND TIP: Total score on my last Target run! 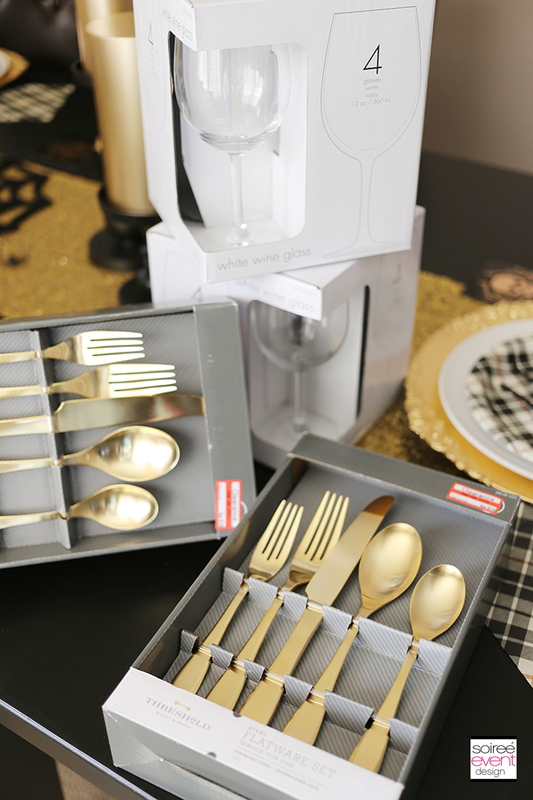 I have been eyeing these amazing gold cutlery sets for a while now. I really wanted to add them to my staple items, but I was always apprehensive since they were pricier than I wanted to spend. I just kept looking at them every time I went to Target—which guys, is a lot! This weekend, I visited my beautiful cutlery once again and they were on clearance for half price! Oh yeah! Now I can add eight sets of these to my staple items stash! Don’t be afraid to stalk your favorite items to see when they get marked down. You can totally score on items you really want and build up your staple dining items. 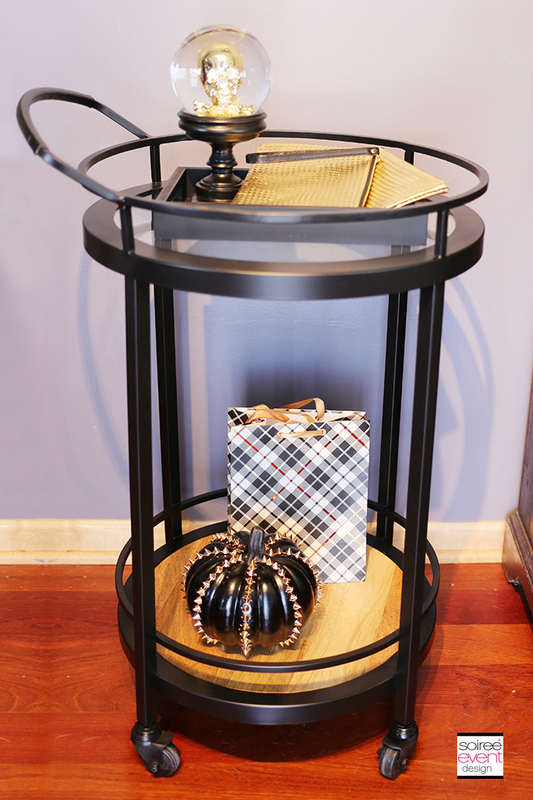 TIP #2: MIX TRENDY GOLD AND PLAID ITEMS IN WITH YOUR STAPLE ITEMS! When decorating my dining table, there are a few items I have on-hand all year, including candlesticks, plate chargers, and runners. 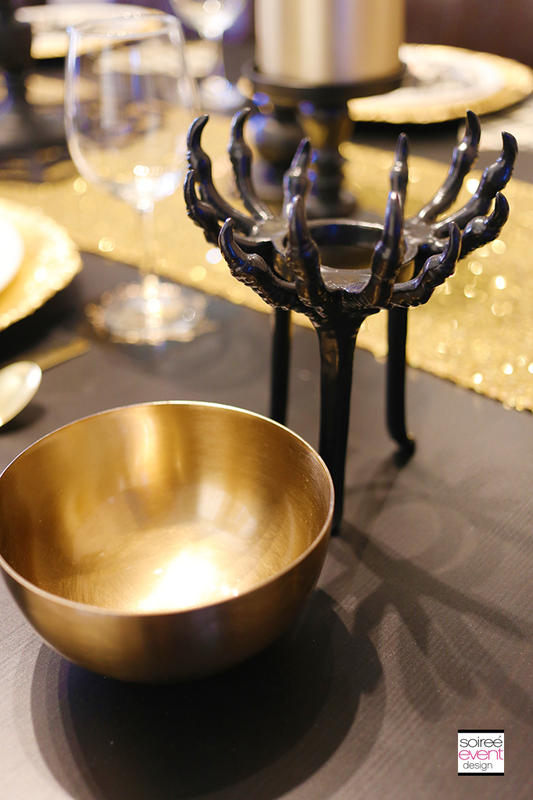 For this Halloween dinner party, I simply started with all my staple items and then layered on top Halloween-themed decor that matched my gold-and-black color scheme. Lastly, I added trendy plaid napkins and plates to accent the table and made a “BOO” word centerpiece from lighted marquee letters I found at Target as well. 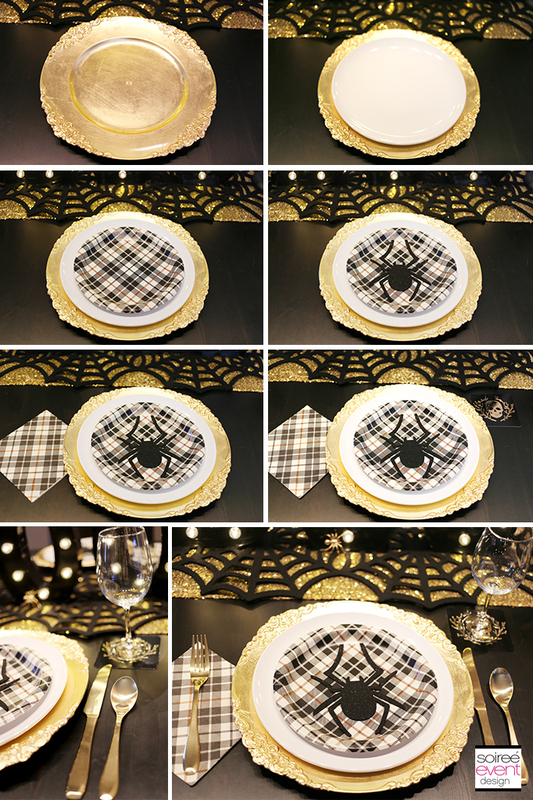 GIRLFRIEND TIP: When shopping for this party theme, I was on a mission to find black-and-gold plaid Halloween plates, but I couldn’t find any. 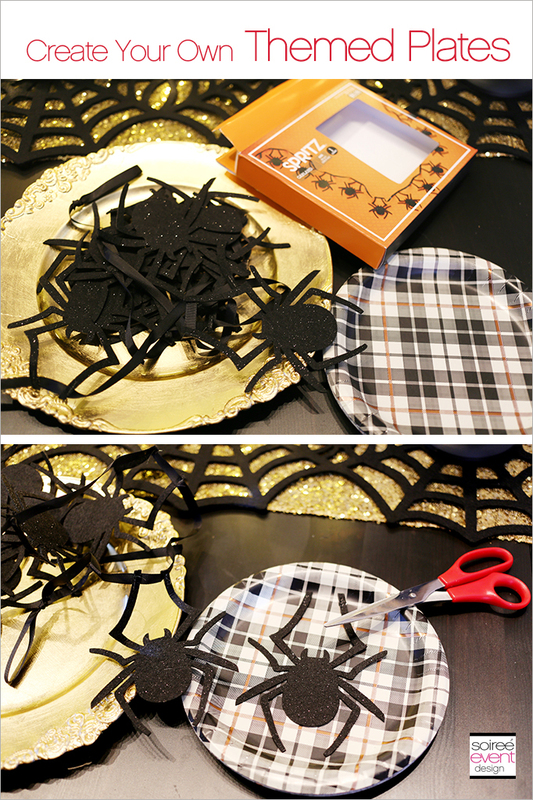 Instead, I saw these disposable plaid plates in the party section and a spider garland in the Halloween section and decided to make some myself! It’s super easy! Just cut the spiders off the garland’s string and place them in the middle of the plates. That’s it. Be sure not to eat on these. They are only decorative and should be removed from your dining table right before you serve your dinner. 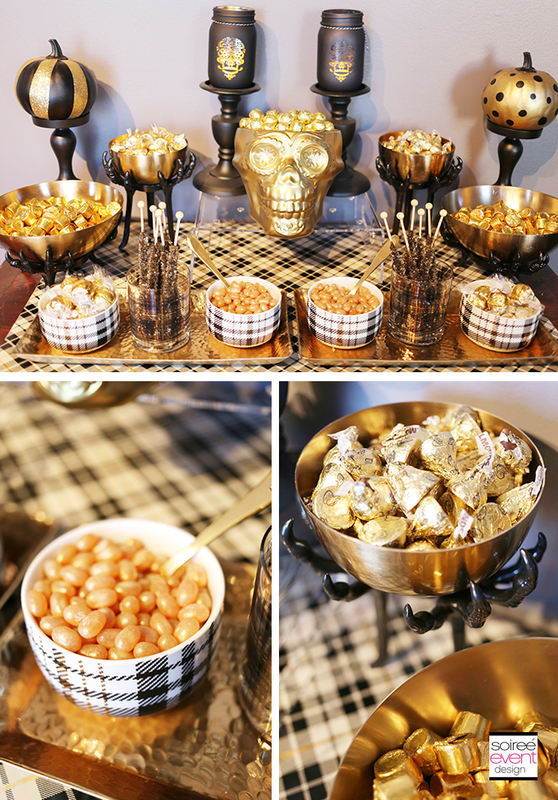 HALLOWEEN GLAM DINNER PARTY TRICK-OR-TREAT CANDY BAR! Halloween is all about trick-or-treating and adults love it just as much as kids! At least I do! For an adult-themed dinner party, offer a variety of adult favorites, such as chocolate truffles, chocolate caramel Rolos, almond Hershey Kisses, and Jelly Belly jelly beans. Did I mention chocolate goes great with wine? Perfect for dinner parties! 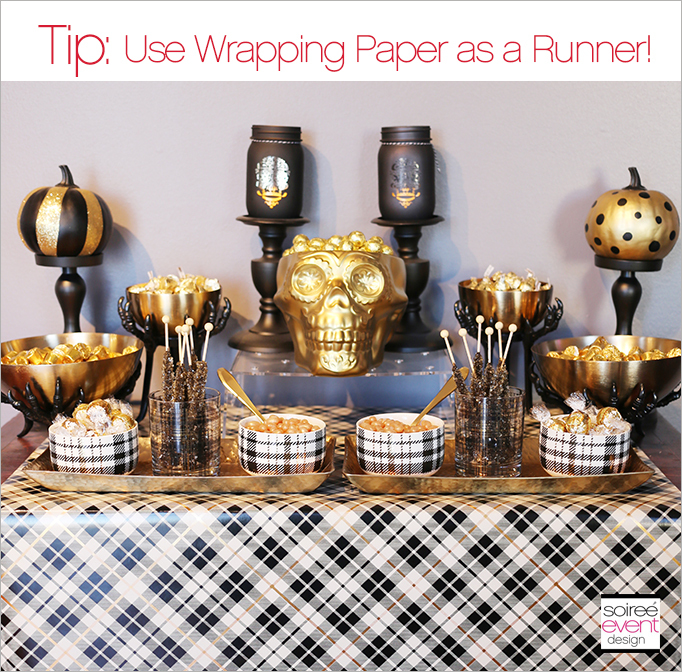 TIP #1: USE WRAPPING PAPER INSTEAD OF A LINEN TABLE RUNNER! I use this tip all the time and, in fact, I am always visiting the wrapping-paper section on the lookout for cool designs that I can add to my party decor. For this, I totally scored when I found a wrapping paper that matched the black-and-gold plaid items I already had in my cart! GIRLFRIEND TIP: Be sure to secure the end of the wrapping paper to the back of your table and then let the other end rest on the floor in front of your table still on the roll. This will give the needed weight to the wrapping paper so it doesn’t curl up. TIP #2: USE TRAYS AND BOWLS THAT CAN BE USED AGAIN IN ANOTHER THEME! 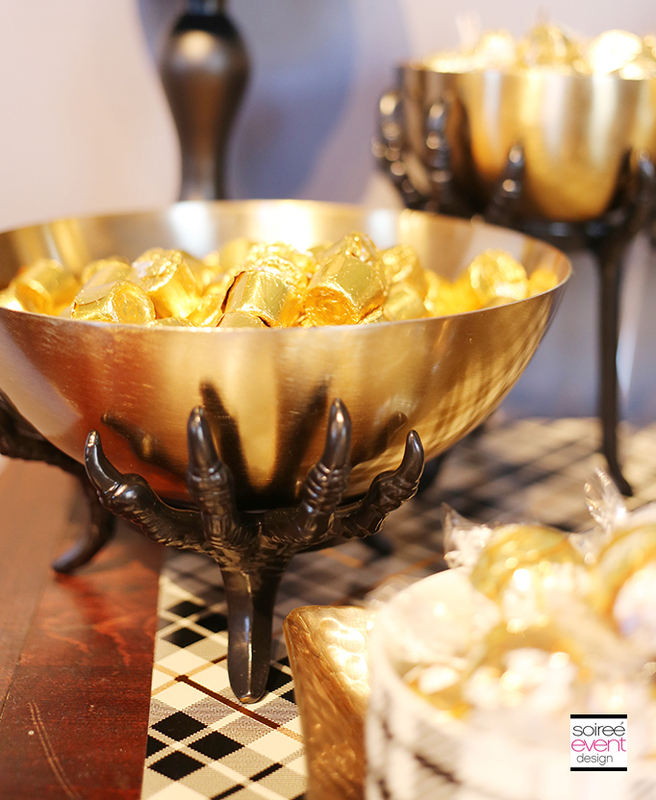 When shopping, I came across these fabulous gold metallic candy bowls held up by spooky black talons! I instantly was in love with these, but it was more than I wanted to spend on four Halloween-themed bowls I would use only once. But after further examination, I saw that the bowls weren’t attached to the talon bases! 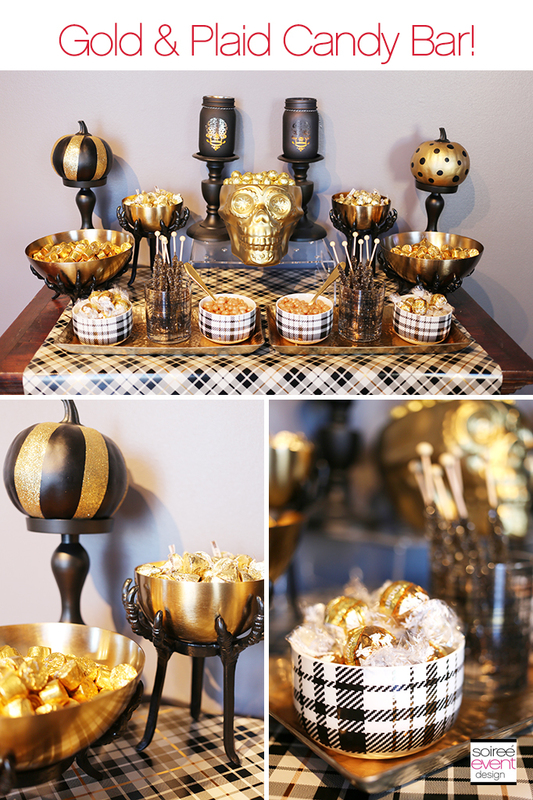 I could use them as-is for my Halloween party and then just use the gold bowls by themselves for my upcoming Thanksgiving and Christmas parties! YUP, totally bought all four! GIRLFRIEND TIP: When looking for candy containers, think outside the box and use glasses like these plaid glasses that were perfect to hold rock candy. 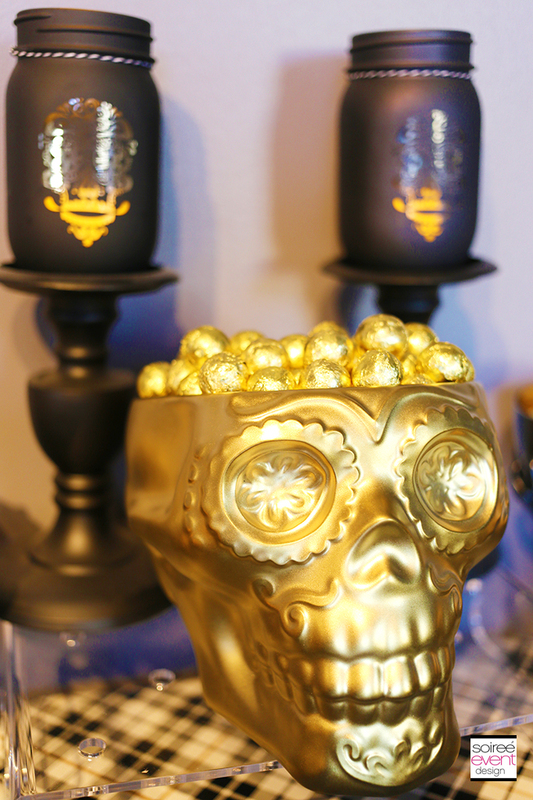 HALLOWEEN GLAM DINNER PARTY FAVOR BAR CART! A bar cart is a staple item we should all have. It can be used in so many different ways for holiday entertaining. Since this was a seated dinner party, I decided to use the bar cart not for drinks, but as a favor bar. 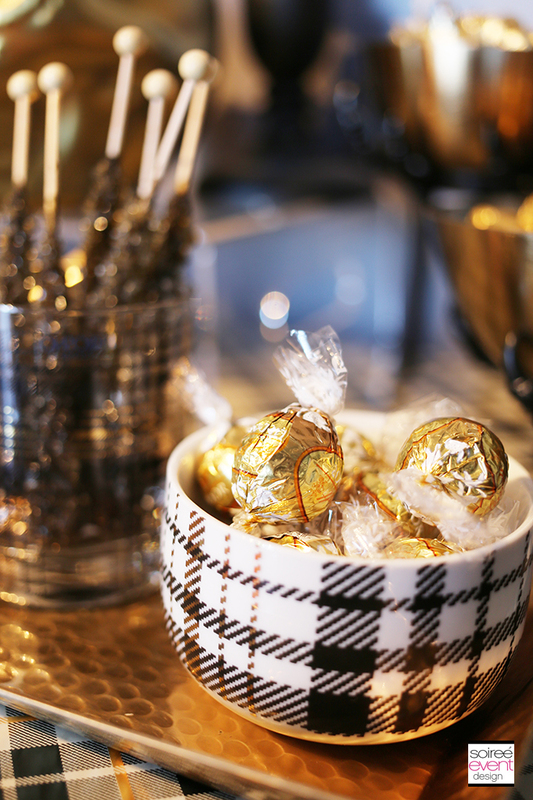 I placed these gold metallic pouches (for the ladies) and plaid gift bags (for the men) next to the candy table so guests could fill them up themselves with the candy to take home with them. ARE YOU HOSTING A HALLOWEEN PARTY THIS YEAR? WHAT THEME ARE YOU DOING? 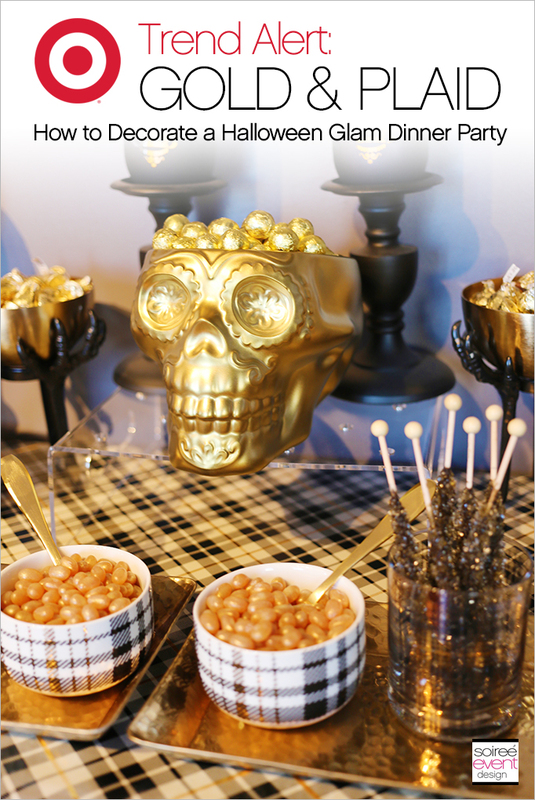 Check out my HALLOWEEN PINTEREST BOARD full of Halloween party and decor ideas! Follow Soiree Event Design’s Halloween Inspiration Board on Pinterest. Ooooh, that looks like such a fancy part! I love all the decorations! Ooh, this is unique and very, very pretty. I love the gold skulls. And those spiky pumpkins! Those spiky pumpkins were so calling my name! Had to have them! Such gorgeousness! I love gold and patterns on table settings. Thanks Heather! I too am now loving the new plaid trend! Mixed with gold…it’s amazing! I love your theme tables. I am slowly working on my stash of plates and cups for photo opps. Where do you get your candy dishes? That is the perfect combination of glitz and class. I have yet to see a party setup you’ve made that isn’t spectacular. All of those decorations are so beautiful! Very cute for a grown up Halloween party! Beautiful Tonya! I’ve been looking for new gold flatware for a long time and also didn’t want to pay too much. Hopefully my Target will have them when I get there tomorrow. Gold and plaid isn’t my first thought for Halloween but this turned out so festive! I love how unique it is. I absolutely love your ideas! What a classy and fun look. 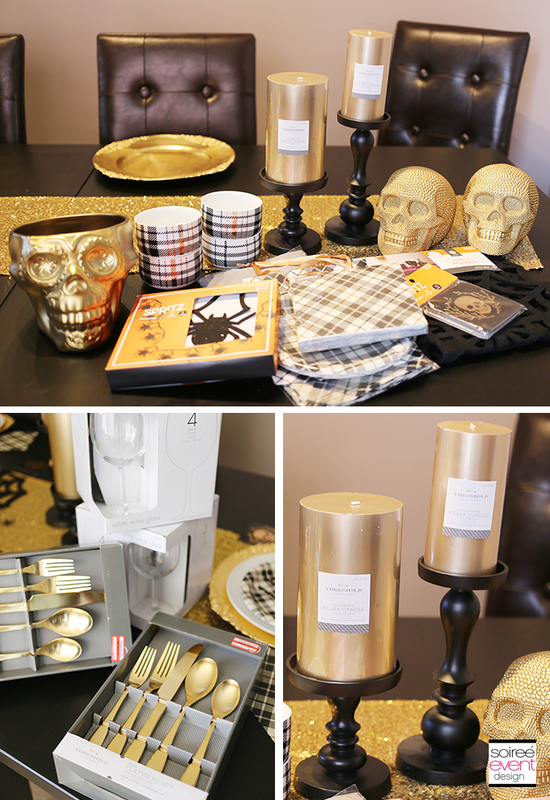 You have highlighted some really amazing products from Target this year for putting together a perfect halloween bash. I love this color theme! 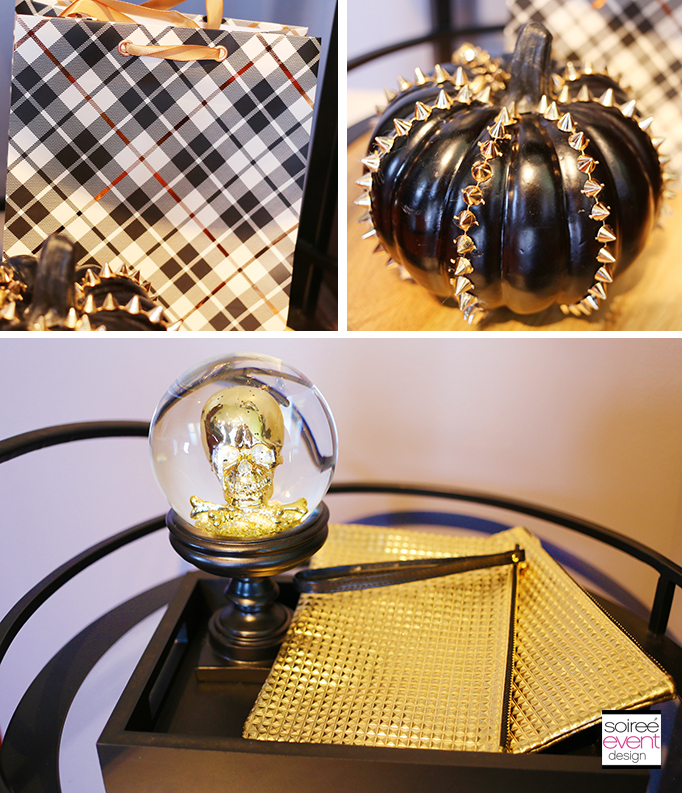 The gold and plaid is an awesome combination and perfect for the skulls. OMGosh! How extremely cute and perfect for entertaining. I love everything and thinks it al goes perfectly together. This is awesome! 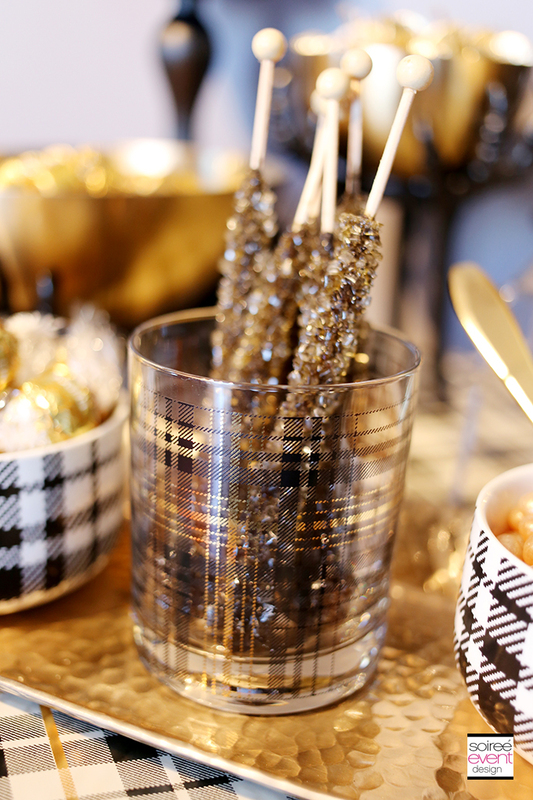 The gold and plaid are so sophisticated yet so fun. A real treat for Halloween! This is awesome! Way to go all out! I want to come to you party! I wish I was half this talented. I really love the gold and plaid look and I’m surprised. It’s definitely not a decor I would have put together on my own, but it does look amazing! When you write your first book I am totally buying it – I admire your designs and would love to see them all in a collective book. wow… this theme is so fabulous.. I think this is my favorite theme for the holiday. You are very creative and talented! I love that everything matches and is themed! Super cute! Wow, this looks like a gorgeous dinner party! I love the gold spiders and all the skulls! Target has so many great table decoration ideas. I stocked up on lots of items there the other day! I love Target! What a beautiful setting. Everything looks stunning. I love your idea of using gold to glam it up. OMGosh! I am loving this so much. The little goth girl in me wants my table to look like this year-round. Gorgeous! 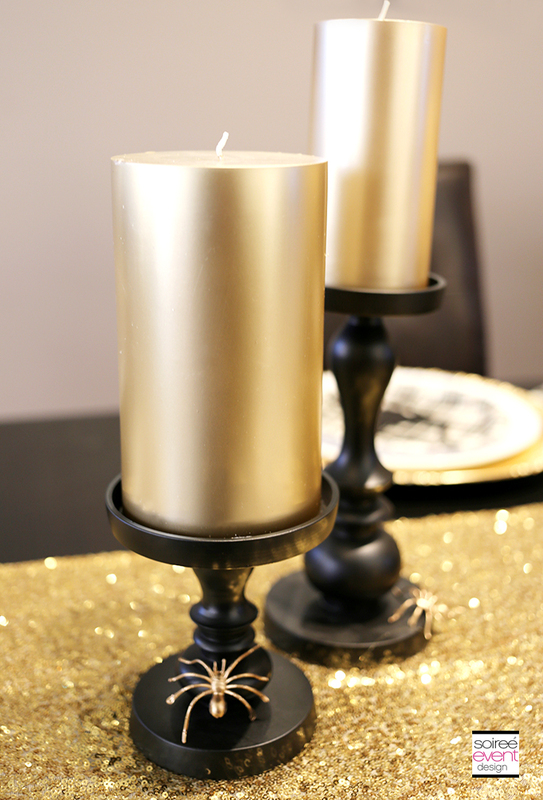 Gold and black are the perfect colors for Halloween decorating. Everything looks great. Talking about glam, this is it! LOve the gold theme! This looks like an amazing party table. I love the black and gold together. I will have to see if i can find some similar decorations. This is so nice! A fancy Halloween party like this would be awesome. I really like those skulls. Who would have thought about using plaid and gold. What a great idea and one that I might have to try and recreate although I know it won’t look as great as this. I wish we had the space to do a party. My family is really big into Halloween and would love this set up! 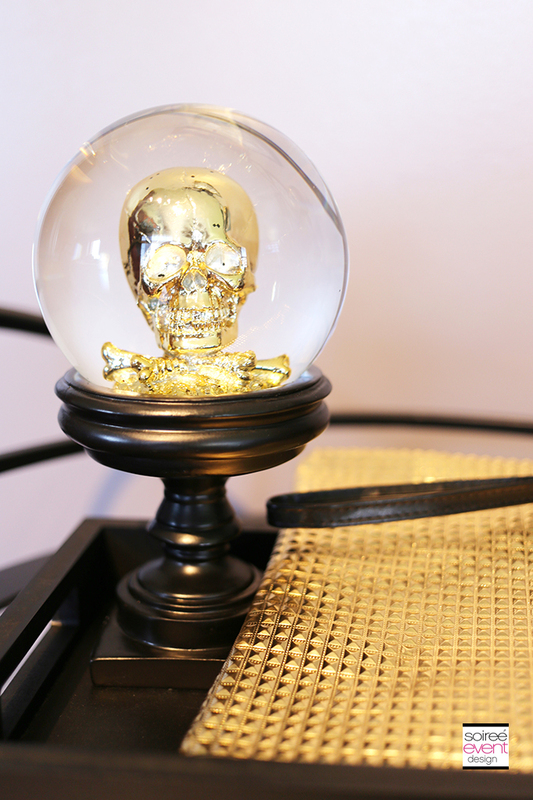 I love the Gold for the Skull….a fun touch for the Halloween Season. Um, that cutlery is AMAZING! I need to get some for my own Halloween get together! I really love your take on it with the gold and plaid – looks great! tonya. this.is.EPIC!!!! you hit the nail on the head with this. how would this be for an adult halloween themed dinner party? target here i come! Wow! It’s scary how sophisticated this Halloween party looks! Way better than the stereotypical scarefests you usually see! I love this!! This would be a great set up for an adult halloween party!! Every single thing about this is amazing. It is classy and fun all at the same time. I want to come to dinner! I love this color/prin combo! It’s festive and unqiue! Great pictures too! I love all the gold I’m seeing around. It’s so perfect for fall, and I just love that they’re incorporating it for Halloween too. Gold and plaid? Who would have thought?? This table scape is gorgeous!! This is all so gorgeous. What a lovely set up. I am loving the gold, it’s really awesome I’d never think gold or plaid for Halloween! 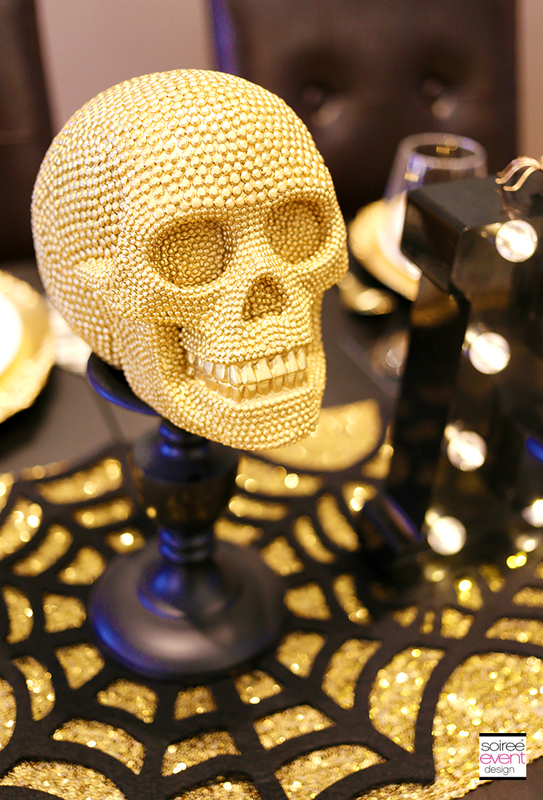 I like the glam skull .. it really sets brings that table to life. Wow I have never seen Halloween look glamerous before! I absolutely love this, so pretty! I just love ALL OF IT! I so wish that Target had stayed in Canada. They were super close to my home and I was a fan. Now I can only dream about Target stuff. Oh wow! 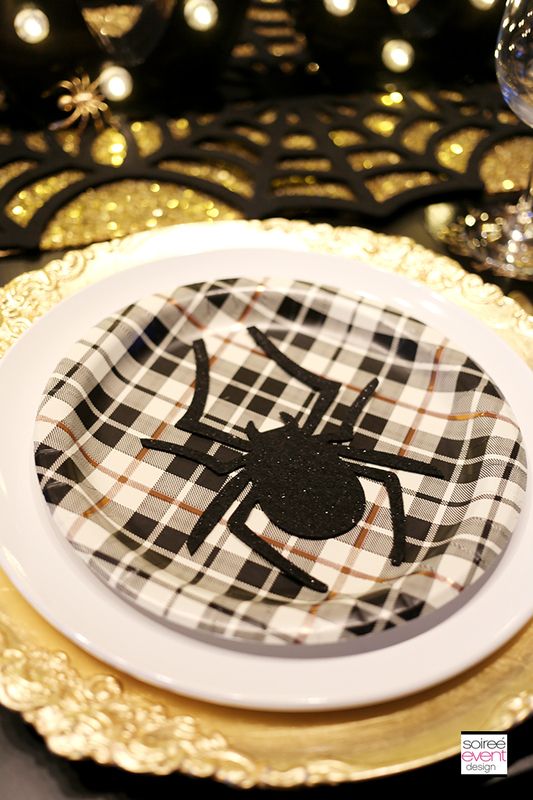 I never would have thought of plaid for Halloween decor, but it works out PERFECTLY! Great ideas and the decor… just wow. That definitely looks like a party I want to be at! Everything is so pretty. Adorable! These ware amazing can’t wait to get some last minutes things form halloween party! Gold and glitter make all things glam! Love the plaid mixed in too. Perfect! 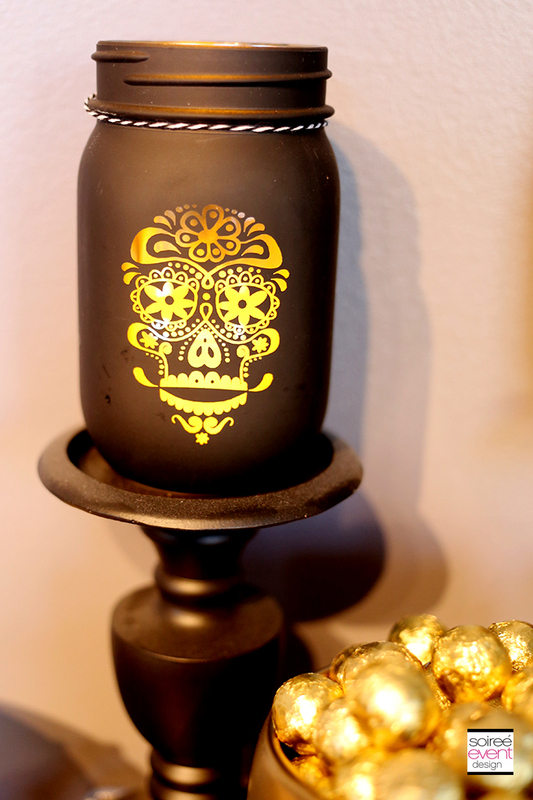 I am lovin’ the black and gold color scheme, and the gold skulls are something that really make the table shine. I also like the use of plaid.